Give the give of music to your favorite music-maker! It doesn't take up space but it will fill their hearts with joy and excitement as they participate in our weekly music classes. 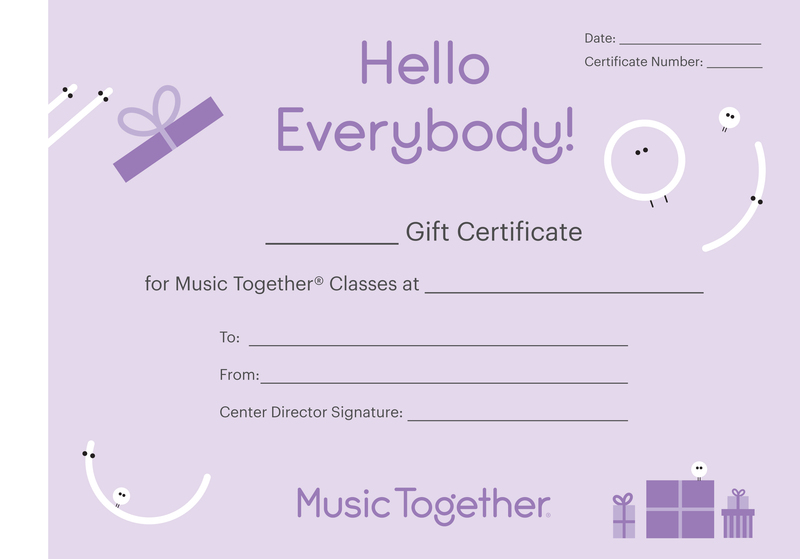 Gift certificates are sold in a variety of amounts including the cost of a full semester with Little Tots Music Together and sibling tuition fees. Full tuition is $220 for a 10 week session. Full tuition for first and second siblings is $125 and $60. For specific questions or requests, please contact littletotsmusictogether@yahoo.com. Gift certificates will be emailed in three business days to the email address you provide in the "comments box". Please provide the student's name and any other information you would like specified on your certificate.